During your initial consultation, we will discuss your concerns to determine if you are a good candidate for Invisalign. We will take x-rays of your teeth, which will be used to create digital 3-D images. From these images, we will map out your treatment plan and tell you the approximate length of treatment. While every case is unique to each patient, treatment typically takes approximately 12 to 18 months. Based on your individual treatment plan, a series of clear aligners will be created specifically for you. These aligners are made of a smooth, comfortable, BPA-free plastic that won't irritate your cheeks and gums. You will begin wearing your aligners throughout the day and remove them when you eat or brush and floss your teeth. 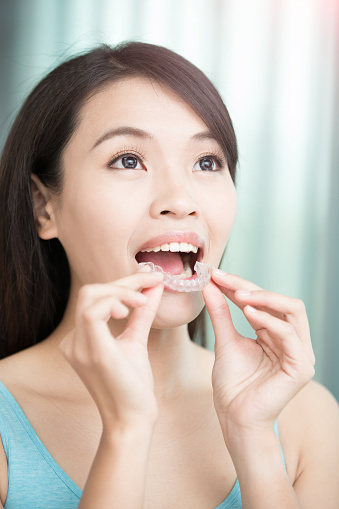 As you wear each set of aligners, your teeth gently and gradually begin to shift into place. To monitor your progress, you will also have occasional checkups with our office, usually only every six weeks or so.